A computer visualization of the sun (red sphere) and its magnetic field lines (orange and aquamarine). The close-up shows the final stage of the emergence of magnetic fields from under the solar surface and the associated X-ray emissions. This sophisticated computer model is used to investigate the drivers of harmful space weather phenomena, including coronal mass ejections. 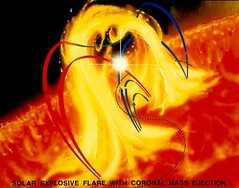 Image courtesy of Cooper Downs, Predictive Science, Inc.
For forty years solar physicists have been endeavoring to both understand and explain the Sun’s dynamic explosions known as Coronal Mass Ejections (CMEs). These staggering events erupt from the Sun at speeds of over a million miles per hour and unleash more energy than the Earth’s combined arsenal of nuclear weapons. However, what causes these huge clouds of hot gas and charged particles? Why does the plasma and magnetic fields literally explode from the Sun? For those interested in the dynamics of astronomy, we’re aware of the astounding affects that a coronal mass ejection can cause in terms of space weather. They don’t just stop at Earth-orbiting satellites… they can even impact terrestrial power grids and more. Now a team of international space scientists, including a researcher from the University of New Hampshire’s Space Science Center (SSC), have published a paper in “Nature Physics” which diagrams the physical mechanisms speculated to be the origin of CMEs. Through the use of computer simulations, the researchers show the detailed connection between these events and the turbulent environment of the Sun’s interior. These new findings could lead to improvement of better space weather forecasting techniques – especially the dangerous ones. “By studying CMEs we learn not only about the drivers of space weather but also about the structure of the atmosphere of the Sun and other Sun-like stars,” says lead author Ilia Roussev of the Yunnan Astronomical Observatory, Chinese Academy of Sciences (CAS) and the Institute for Astronomy at the University of Hawaii at Manoa. Space scientists don’t take CMEs lightly – especially when they are aimed towards Earth. Intense geomagnetic storms are harmful to astronauts in space, can interfere communications and GPS satellites, reroute airline flights over polar regions and disable power grids. Despite their destructive force, coronal mass ejections can also be things of beauty – creating spectacular auroral activity. According to the news release, the Nature Physics paper, titled “Explaining fast ejections of plasma and exotic X-ray emission from the solar corona,” provides an explanation of the origin of fast ejections of magnetized plasma from the Sun’s atmosphere and associated X-ray emissions. It thus demonstrates a fundamental connection between the magnetic processes inside the Sun’s interior and the formation of CMEs.